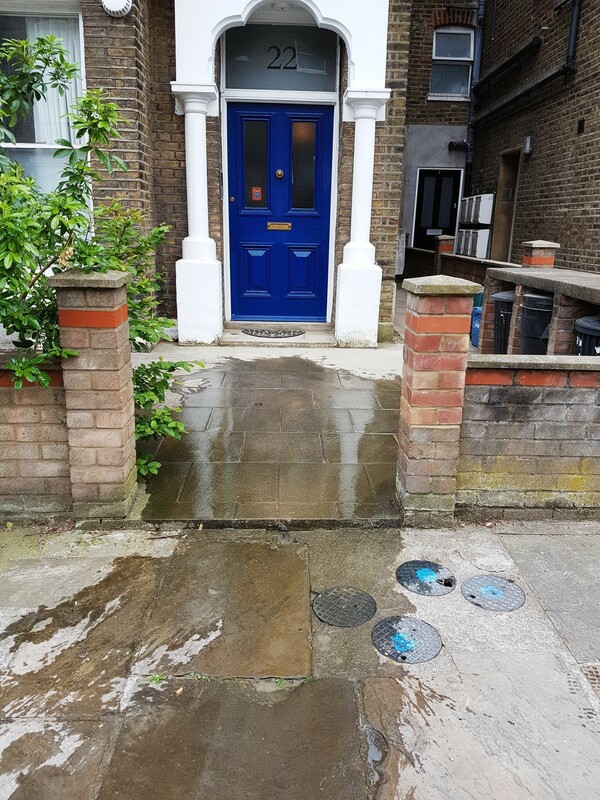 Garratt’s Damp & Timber Ltd was approached by a property owner regarding damp problems suspected in the communal entrance to their four-flat structure. 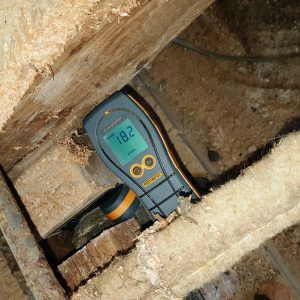 They had previously commissioned an independent damp survey prior to obtaining our own free of charge survey. 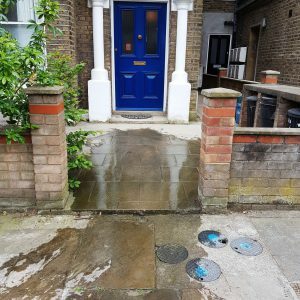 It was discovered and agreed upon, in the independently commissioned report, that the communal entrance was suffering from wet rot which had caused the boards to degrade. 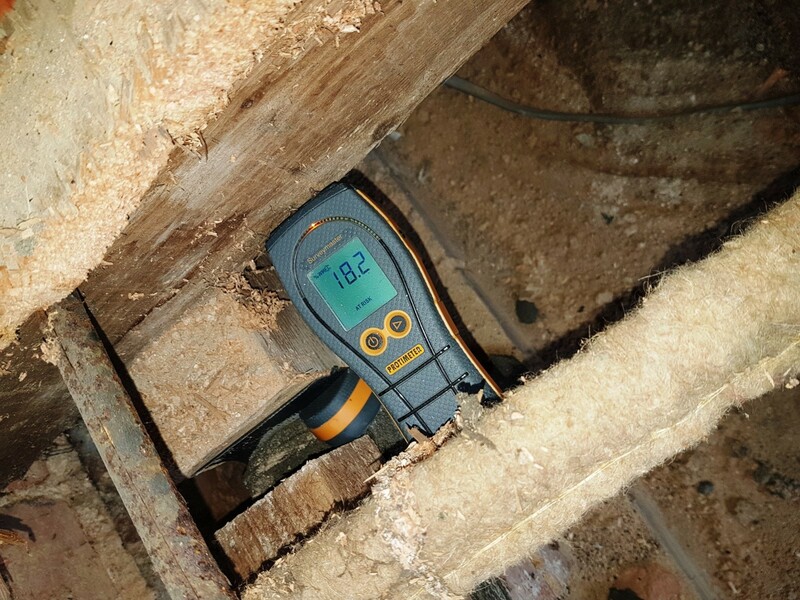 It was suggested in the independent report that the joints, floorboards and wall plates affected by wet rot should undergo a complete replacement and further ventilation added in the subfloor to prevent the problem reoccurring. Additionally, it was offered that a positive pressure system was to be implemented and a replacement floor fitted with additional supports to increase durability. Considering the amount of work estimated in the report, skills were required covering carpentry, plastering and electrician work, all of which we were able to cover with our expert, all-rounded team. While it was work our team was familiar with, there were several problems that delayed the repair process. Firstly, we had to completely remove the hallway floorboards in the entrance hall, while still providing access to homeowners and their guests. We were further hindered when trying to remove a large section of corrugated steel between the RSJs and floor joists – thought to have been installed by the original owner as an under-stair shelter during WWII. 1) Installation of three new periscope vents on the flank wall, which had no previous sub-floor ventilation, to provide air cross-flow with the pre-existing vents which were installed under a bay window on the front facing wall. 2) Airflow circulation was added to the cellar area below the hallway and ground floor property using a Nuaire Flatmaster positive pressure system installed on a moisture-proof board. The air flow system was drastically needed to remove moist air from the cellar area and sent the moist air out through the sub-floor vents. 3) Removal of all rotten timber including joists and wall plates from the degrading hallway floor. 4) Installation covering 6sqm of new treated timber, with the ends protected by a damp membrane, across the entire hallway. The marine ply was fitted level so to provide an even surface for homeowners and guests to walk across and enable the customer to have commercial grade carpet laid. 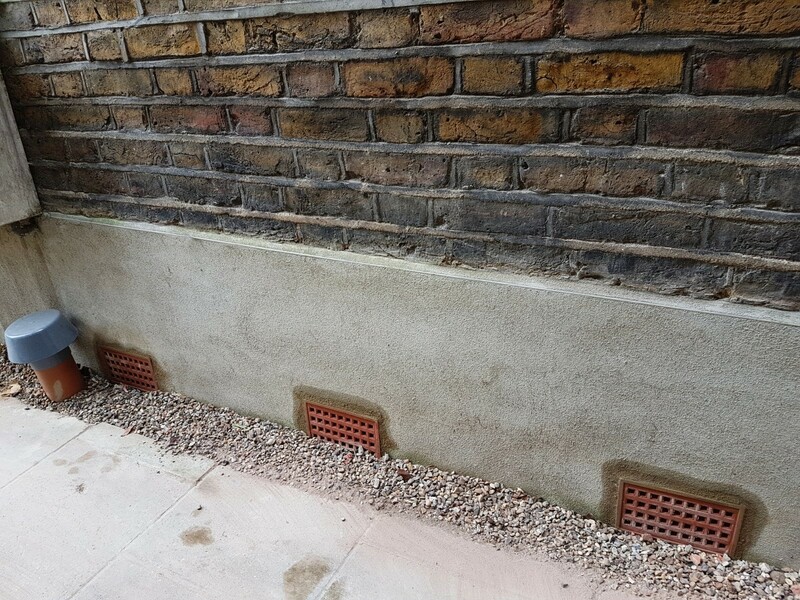 5) Removal of all damp-afflicted plaster on the flank wall – the wall was taken back to brickwork and injected with a chemical Damp Proof Course prior to being covered in a Sika waterproofed render. Finally, the wall was given a light finish of plaster ready to be re-decorated once the render had completely dried in five weeks’ time. 6) Once the repairs were completed, we removed all of the support and protection that had been in place during the work process and cleaned the work areas we had had access to. This included a sweep and removal of the majority of the dust created during our repairs. 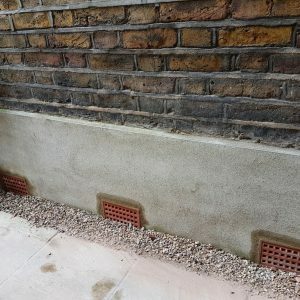 Without our team dynamic of multi-skilled tradesmen, the repair job could have required further contractors and, in turn, taken a lot longer to finish. We were able to carry out all the necessary repairs and installations from start to finish with our expert staff. We hope this case study has been informative and an enjoyable read. If you require any further information, have an unanswered question or want to leave us some feedback, get in touch via info@dampproofing-london.co.uk.